Morshed Mostafa Sa’idi became an apprentice to a eulogist (rowze-khan) at the age of nine, with whom he travelled throughout Iran for three years. 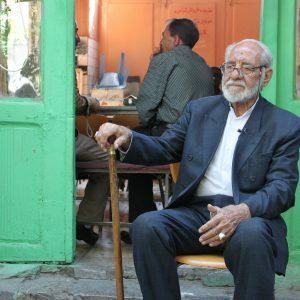 At the age of thirteen, he saw a recitation of the Shahnameh in a coffeehouse in Isfahan and was so captivated by the performance that he left his mentor and joined Morshed Karam Isfahani to learn the tradition. He started performing in the Shakheh-Nabat Coffeehouse in Borujerd and his voice had such an effect on the audience that he became known as “the storyteller with the velvet voice.” He started compiling the accounts of the Shahnameh according to the storytellers (naqqals), when he was seventeen and published the work in two volumes forty five years later. He is among the last naqqals of his generation, and is actively involved in mentoring young storytellers who continue the tradition while adding their own style to the craft.